Today's bounty was unplanned really. I had a self-sown tomato plant appear in one of my raised beds. The plant, with no care from me at all, has managed to produce a decent amount of fruit. My friends and family will tell you that this is not something I would be especially pleased about it - I can't stand tomatoes. I often wish this wasn't the case as it does place limitations on foods I can eat. 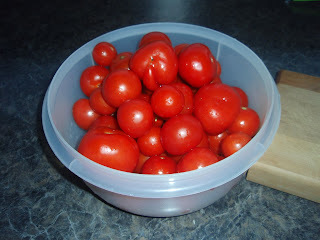 I have wondered whether I am just being fussy but the last time I ate tomato I was very ill. It's the only time in my life I am aware of that I was so ill that I burst blood vessels in my eyes from the vomiting. Oops, was that too much information? Anyway, it's not like me to let things go to waste so I decided to collect up the tomatoes, cook them up with some onion, garlic and fresh oregano and freeze the resultant sauce. Of course the sauce isn't a lot of use to me but will come in handy for my family to use. 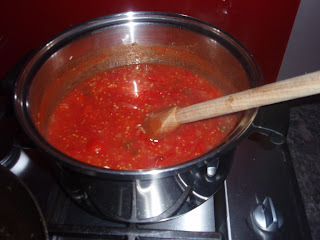 :) Here are a couple of pictures of the dreaded produce and the sauce I made. Lovely fruit! I have the same issues with ice cream that you have with tomatoes. I am offered little support in the matter. Wonferful you didn't waste them and prepared them for family. Very thoughtful!